The Estate has 107 hectares of conifer and broadleaf woodlands grown for commercial timber production and local amenity. 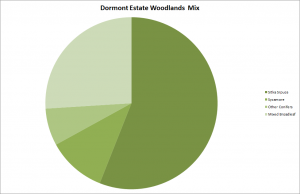 Of the 107 hectares of woodland 56% is Sitka Spruce and other Conifers, and 36% is mixed broadleaves (Sycamore,Oak, Beech and Birch) which is grown for Comercial Forestry and Conservation. The conifers are managed for clear felling at 30 to 35 years with this timber selling principally for construction. Thinnings are taken go into the pulp wood, pallet wood and fuelwood markets. The broadleaves are managed for clear felling at approximately 80 to 90 years with thinnings going in to a variety of markets. Sales of timber are mostly on a standing basis.